I’m often amazed at how the look and feel of footage or stills changes over time. On returning from a long trip it is often straight into an edit, delivering stills and video to sponsors and broadcasters. One is forced to delve straight into the material and start working with it. There is often not time to digest the experience and leave the photos or video until later so you can look at them with fresh eyes. After my return from Ellesmere Island it was a blur of six months in dark edit suits to deliver the film to our broadcaster. Then it was the chaos of social media and marketing before the broadcast followed by an exhausted crash over the festive season. I woke up yesterday and realised that on the 1 April it will be a year since we set foot on the ice. It was a bit of a jolt. So, I decided to do a little reminiscing last night and for the first time I went through all the photos from the expedition, which unbelievably I have not yet done. Below is a short photo essay of some of my favourite overlooked shots. Frozen berg and skier. 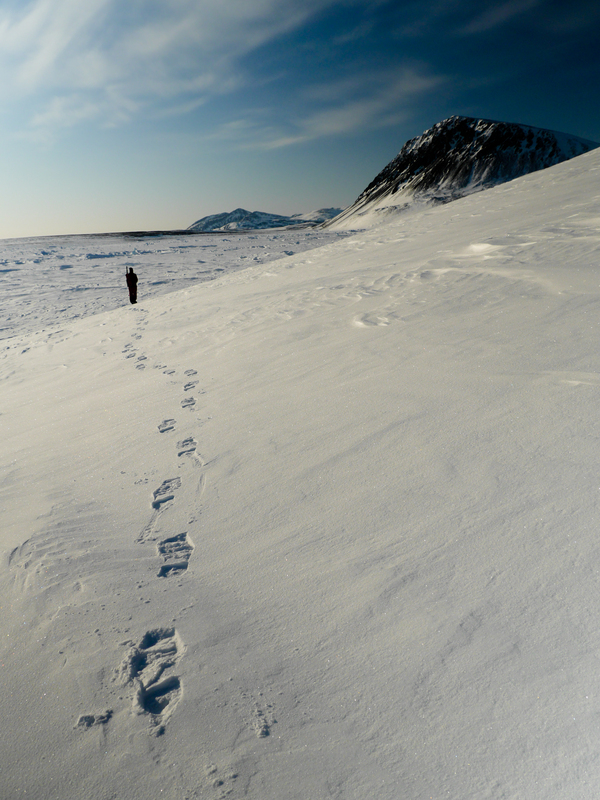 Eureka Sound, Ellesmere Island, Canada. Although for Elle (snowball) and Napu it was never a problem. But what is a little frostbite when compared with this magnificent sundog. Curious polar wolf. Hmmm there appear to be dogs here! Our final frozen berg before the plane picked us up. We’ve just published our New Land Film website. Check it out for some extra stories and exclusive extracts from the film. In our final week of making New Land (a film about an Arctic expedition) we were in the edit suite in Cape Town putting the finishing touches to the film. This included giving everyone a title when you met them for the first time. My title was going to be Expedition Filmmaker which we then had to translate into Norwegian. We had a good laugh when we discovered that no such word exists in Norwegian. To avoid confusion we decided to just stick with filmmaker. This raised an important question though. Is there such a thing as an expedition filmmaker? Actuality documentary can be broken down into many sub sections. You get social filmmakers; natural history filmmakers etc. But I had never stopped to think if expeditions required their own subsection? I just assumed that it was a natural category which must be in use and recognizable. It is a rather fringe activity and perhaps should just fall under film making in general? Perhaps an overarching category of adventure filmmaking? Its an interesting question. However I don’t think it is a trivial one as in order for a genre to develop and mature it needs fall into a category in which conversations about craft, story telling and aesthetic can be discussed. Expedition films are sometimes not as well conceived as they could be and rely on hard to get footage of extreme environments or activities, without much thought to character development, story arc etc. Like many people I am drawn to stories of daring and survival and look forward to watching them on TV and at festivals. However I am very often left feeling underwhelmed and frustrated that they could have done a better job of telling the story. This is a good example of what I am talking about. Azazel is a film that screened at the Banff Mountain FIlm Festival in 2010. It is not very well made. The shooting is amateur and the editing too, but it is such a great story. No fancy gopro shots, or drones flying aerials, just good story telling. I love this film. It makes me feel like I am on the expedition with them. It also underlies the one thing I tell anyone who asks me for tips on filming an expedition. It all boils down to one thing. Have your camera handy at all times and film when the going gets tough. I’ll be speaking about expedition film making tips and tricks learned through ten years of working in harsh environments on the 14 February in Finse, Norway as part of the Expedition Finse weekend event. Finse is a high mountain plateau in a region called Hardangervidda. Polar nerds will know that it is famous as being the place that polar greats like Nansen, Amundsen and Scott trained for their polar journeys. The hotel there has incredible historical photographs on its walls and practically oozes a polar tradition unrivaled anywhere else. 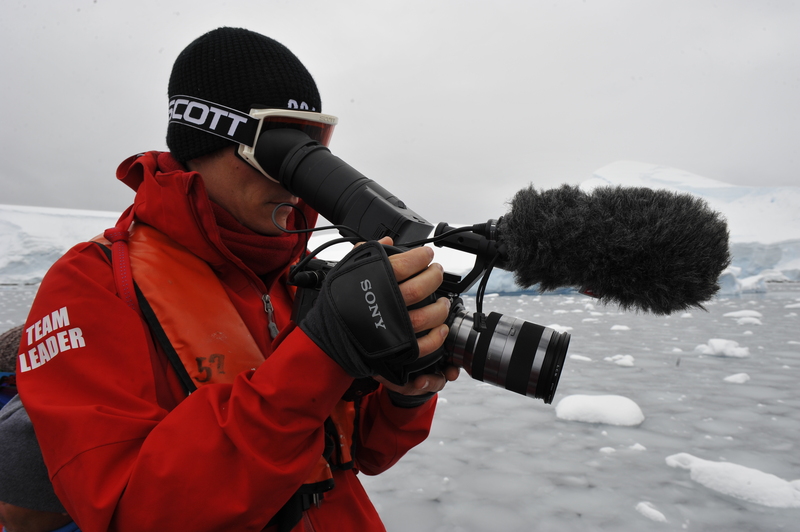 The talk will be a combination of a practical and philosophical approach to filming in harsh environments. How to tell a compelling story and importantly how to make new technologies work for you and not the other way around. Its finally done! Three months of freezing filming and four months of sitting in an edit suite. NEW LAND: Otto Sverdrup’s Arctic Kingdom will be airing on Norway’s TV2 on 30 December. The trailer is currently in Norwegian, an English version will follow soon. Many thanks to our awesome producer Miki Redelinghuys and the expedition team: John Huston, Tobias Thorleifsson and Hugh Dale-Harris.